1 of 1 In food processor, pulse graham crackers until fine crumbs are formed. Add sugar and butter; pulse until crumbs are moistened. Press into bottom and up side of a 9-inch springform pan. Refrigerate. 1 of 2 In a large bowl, beat cream cheese until smooth, about 1 minute. Add sugar and cornstarch; beat on medium-high speed until creamy, about 3 minutes. Add eggs, one at a time, beating well after each addition. Add brandy and creme de cacao; beat until smooth. Pour filling into crust. 2 of 2 Bake at 325 degrees F until edge of cheesecake is just set and center slightly jiggles, 60 to 70 minutes. Transfer to wire rack. Run a thin knife around inside edge of pan. Let cool completely. Cover and refrigerate overnight. 1 of 1 Remove side of pan. Whip heavy cream and sugar to stiff peaks. Use to garnish cheesecake. 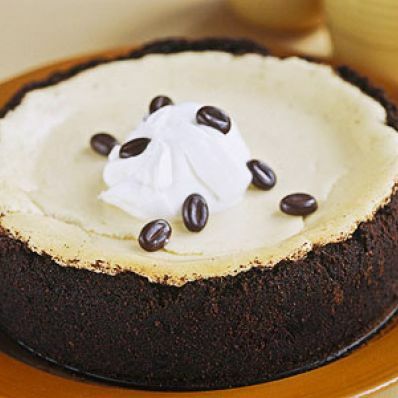 Scatter with chocolate-covered coffee beans. Per Serving: 32 g Fat, total, 35 g carb., 7 g pro., 465 kcal cal., 261 mg sodium, 1 g fiber, 18 g sat. fat, 140 mg chol.